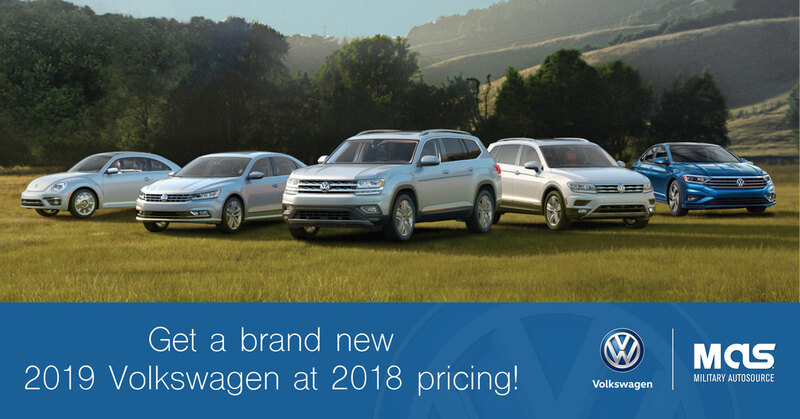 Starting June 15th, overseas U.S. Military can purchase a 2019 Volkswagen and lock down 2018 pricing! Hurry, this offer only last a limited amount of time. For over 60 years Military AutoSource (MAS) has provided our customers with direct access to the widest range of factory military programs available to active duty military, civilian, DOD employees, and members of the diplomatic community stationed outside of the United States. We are the factory authorized military distributor of U.S. specification Volkswagen vehicles. When you buy from MAS you gain access to exclusive benefits available only to U.S. military members. You may choose to have your vehicle delivered overseas in Europe or stateside when you return home. Don’t miss your opportunity to find the perfect Volkswagen vehicle. Reward yourself. You deserve it. Click the request a quote button below, send us your information and a local representative will reach out to you to provide more information on pricing, options, and how to take delivery.